Designed to accept a wide range of floor coverings, Levelrock RH floor underlayment can be applied quickly and provides a compressive strength of up to 3,500 psi. We know that interior concrete floors can be elegant, artistic, stylish and sophisticated, but warm? Yes, thanks to radiant heat technology. “Radiant heat is the only way to make concrete a warm, comfortable surface,” according to John Sweaney, Western regional sales manager for Watts Radiant, Springfield, Mo. Mark Eatherton, operating partner of Advanced Hydronics, Denver, Colo., believes people should not be distracted by a heating system or by uncomfortable temperatures. “When you walk into a house with a radiant floor, you walk into a blanket of comfort,” he says. The basics of radiant heat systems have been covered in this magazine and can be found on the Web site of the Radiant Panel Association. The purpose of this article is to cover some new developments in codes, materials and applications. 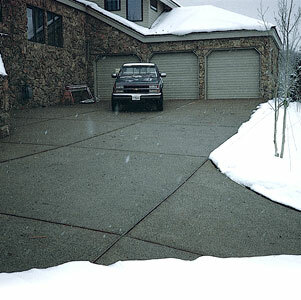 A snowmelting system can be manually controlled or set up with a sensor that will turn it on automatically when snow falls. The most common insulation for pours on or below grade is extruded polystyrene installed under the slab and around its vertical perimeter, according to John Sweaney. “Insulation thickness and R-value depend on the location and climate of the project, but an inch to 2 inches is typical,” he says. He adds that tubing should be spaced 6 inches on center where it passes close to exterior walls and 12 inches on center four feet or farther into the room. Finally, he recommends following local best practices for moisture or vapor barriers. “You absolutely have to insulate,” Mark Eatherton emphasizes. In fact, he was instrumental in creating local codes that require proper insulation. This requirement has since been included in the International Mechanical Code. The result is improvement in radiant heat’s reputation for efficiency and comfort. A new insulation product solves several problems at one time, according to Bob Rohr of Show Me Radiant Heat and Solar, Rogersville, Mo. 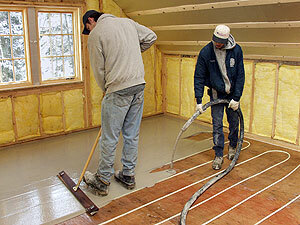 The Crete-Heat Insulated Floor Panel System is a modular EPS foam board insulation supplied in interlocking panels. A polystyrene film on the backside acts as a vapor barrier. A three-dimensional grid on the top allows installers to snap in hydronic tubing at accurately spaced intervals. The spacers extend above the tubing so the panels can be walked on without dislodging the tubing. 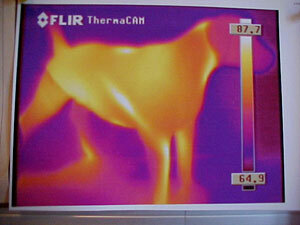 An infrared picture of the dog statue showing radiant heat at work. 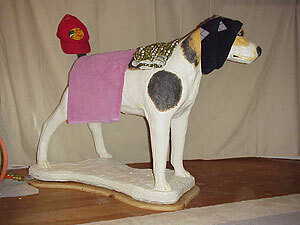 Seemingly, the dog has no heat in its head. Wells also emphasizes correct concrete thickness. “Remember that saw cuts are one-quarter the depth of the slab, so the tubing has to be set deeply enough to prevent damage,” she cautions. John Sweaney points out that the creation of expansion joints allows the two masses of concrete to move separately. If a lot of movement is anticipated, he recommends sleeving the tubing with PVC or other rigid materials for 6 inches on either side of the joint. This removes the stress of movement from the tubing and transfers it to the sleeve. 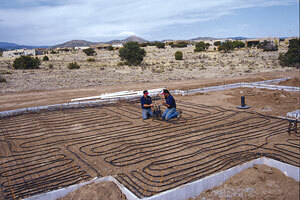 A radiant heating installation for a home in Santa Fe, N.M. The radiant tubing is Watts Radiant Onix. Levelrock RH floor underlayment is formulated specifically for use with residential electrical and hot water radiant heat systems. While concrete is considered by many to be the first choice for radiant heat in slabs on or below grade, gypsum cement is more often used above grade. Now a new product has been developed specifically for radiant heat that overcomes some drawbacks of this material. Levelrock Floor Underlayment RH from United States Gypsum Co. (a subsidiary of USG Corp.) offers a smooth, crack-resistant surface that can be topped with a decorative microtopping as well as traditional tile or wood flooring. High compressive strength and resistance to shrinkage set it apart from other underlayments as being especially well-suited for radiant heat. Levelrock is pumped through a hose in two stages. Dennis Socha, Levelrock business manager, recommends mixing the first lift at the lower limit of the slump range to make it stronger and hold the tubes in place. The second lift is typically poured at a slump toward the higher end of the range for a smoother finish. Slump tests are conducted on the job site to determine the flowability of the material. The second lift should be applied within an hour or two of the first lift or as soon as the first lift can be walked on to create a strong bond. A typical installation crew consists of four to six people. At the application end, there is one to handle the hose and one with a gauge rake to set the appropriate thickness and finish the material. A larger job may require an additional person to help handle the hose. At the mixing end, down by the pump, there are two more crew members — one person running the pump and one who is a material handler feeding the sand and cement. Again, larger jobs may require an additional material handler. A crew like this can install upwards of 10,000 square feet to 15,000 square feet in a day. 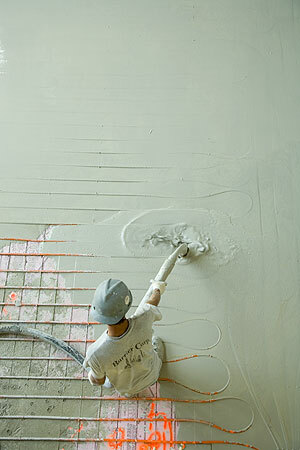 The quick setting process of the Levelrock underlayment allows for trade traffic on the floor the next day. This product is usually more consistent than lightweight concrete that might be used over plywood on upper floors. That’s because it is formulated under controlled conditions. No additives or ingredients besides sand and water are added on-site. USG sells Levelrock RH only to authorized applicators, according to market manager John Mandel. The authorized applicators can also install the microtopping, which can then receive a decorative stain or coating if desired. Some concrete contractors have added installing Levelrock or other floor underlayments to the services they offer. Other applicators may be drywall, insulation or flooring contractors. Mark Eatherton recommends that the tubing be installed by a fully trained, qualifed hydronic-heating contractor. While some concrete contractors add this expertise to their repertoire, it is more common for them to partner with a plumbing or heating contractor.